Cory Hunter, CPA has more than ten years of public accounting experience, He started his career as a tax preparer and tax consultant, and then added to his resume by switching to our audit department. Cory's experience includes providing audit, reviews, compilations and tax preparation services to nonprofit organizations, private companies, public companies, housing authorities and multifamily properties including low-income housing and tax credit projects. 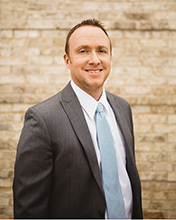 Cory specializes in conducting and supervising audits of public companies, non-profits, other organizations requiring Yellow book and A-133 audits and tax preparation services. Cory has a Bachelor of Arts in Accounting and a Master of Science in Accounting from Weber State University. Cory is a member of the American Institute of Certified Public Accountants (AICPA) and the Utah Association of Certified Public Accountants (UACPA). His outside interest include playing and watching sports, camping, fishing and spending time with his family.